Universal Studios Hollywood's 13th annual "Day of Giving" event on Thursday, November 9, 2017. Theme parks make for a terrific way to escape from everyday life and to draw tourism and spending to an area, but they can also give back to their local communities in meaningful and heartfelt ways. Such is the case with Universal Studios Hollywood‘s annual Day of Giving, which held its 13th yearly event at the Los Angeles-located park this past Thursday. 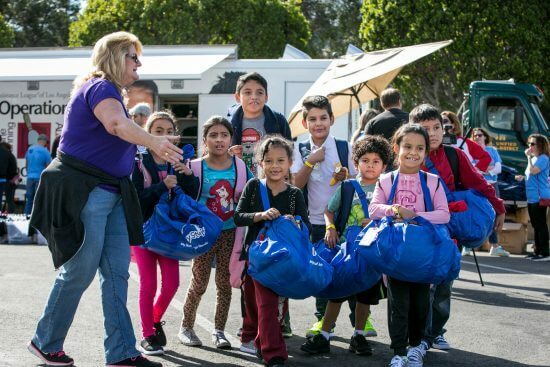 Serving as the home base for Operation School Bell (one of six charities represented by Day of Giving), Universal Studios Hollywood and its team members helped nearly three hundred homeless children gain access to new clothing, sneakers, and school supplies. The children also enjoyed a day of fun in “The Entertainment Capital of L.A.,” where they experienced the Wizarding World of Harry Potter, Despicable Me: Minion Mayhem, and the world-famous Studio Tour. Discover a Star Foundation was founded in 1995, with the stated mission of providing financial assistance to local nonprofit groups in the Los Angeles area, with over nine million dollars having been raised in the ensuing twenty-two years. To find out more about the program and how Universal Studios Hollywood is helping to improve Southern California and its communities, be sure to visit the park’s official website. That was great to know! Offering helping hand gives a ray of hope to the people who are in need. We should always be ready to help others which give them a ray of hope for living a good life. It is not always necessary to make a bigger donation, but a small donation will also help the needy one. Other than the donation, one can also be a part of mission humanitaire ( http://www.mission-humanitaire-afrique.org/partir-en-mission-humanitaire-afrique/ ) volunteering by joining charity for helping needy and less fortunate people.